With Bob Dylan having declared Paul Brady to be a “secret hero” of his, you know there’s got to be some serious pedigree from an artist in a career spanning a period of some 54 years now. The record sags slightly in terms of quality after the first couple of numbers, with ‘Something to Change’ and ‘Say You Don’t Mean’ sounding a bit repetitious, but the album is at its very best with the slower, more reflective numbers, particularly the album stand outs, ‘Once In A Lifetime,’ (about the redemptive power of love), and the reflective ‘Oceans of Time,’ which has a lovely flute solo. 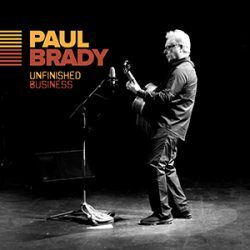 The breadth of music on offer on ‘Unfinished Business’ is mightily impressive and proof that even after such a long time away, Paul Brady still has much to offer. Bob, no doubt, would still approve.